Events in the Indian sub-continent during the 1970s, where, in the summer of 1975, the ruling party engineered a ‘constitutional’ coup by declaring a national emergency, re-emphasised the need for a fuller understanding of India’s social system and people. First published the following year, in 1976, Inside India Today attempted to fulfil that need. Drawing on personal interviews, conducted during his two years’ travels throughout the country collecting a mass of first hand evidence, and on various surveys and studies published in the press, the author sketches a broad portrait of Indian life in the villages and cities. 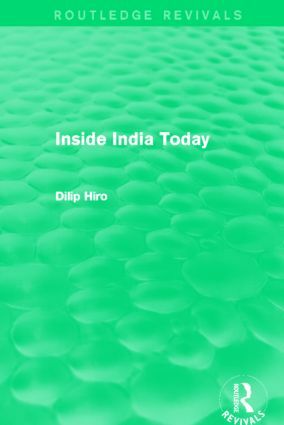 Hiro relates this research to the existing socio-political structure of the time: the constitutional framework, the electoral system, the performance of the Indian National Congress and the Communist system. Written in an accessible, engaging styleand containing a wealth of information and insight, Inside India Today is a major contribution towards the scholarship surrounding this complex and fascinating country. Preface; Introduction; Part I: Life in India: A Report 1. Village India 2. Urban India 3. A Corrupt Society; Part II: Politics and Economics of Centrism 4. Present political-administrative structure 5. Electoral politics 6. The Congress Party: facing both ways 7. The Congress Government: the unfulfilled plans 8. Agrarian relations: the half-hearted reform 9. Industrial policies: ‘socialistic’ capitalism 10. Trade unions: divide and rule; Part III: Leftist Forces 11. The Communist movement: before 1964 12. The Communist movement: after 196413. Extra-parliamentary Communists 14. West-Bengal: revolution and counter-revolution; Part IV: Rightist Forces 15. Rightest forces: political 16. Rightist forces: institutional; Part V: Resilience of the System 17. The internal strains 18. Internal strength and external support 19. A ‘constitutional’ coup: an act of desperation 20. The future: a leftist advance ahead; Postscript; Notes; Select Bibliography; Index.